Many of our older players will say that twenty or thirty years ago much more attention was paid to bowling green etiquette. In my experience (as a member since 1969) this is true but fortunately lawn bowls remains one of the few sports where common courtesy and etiquette is still prevalent. We should be proud of this and in order to make the game as enjoyable as possible bowling green etiquette should be promoted to members old and new. Much of this is common sense but here are some of the main rules of etiquette. Dress appropriately and ensure that you know the dress code for each game or match in which you are participating. Do not show disrespect for your opponent(s) by arriving late, ensure that you leave sufficient time to change before the game. 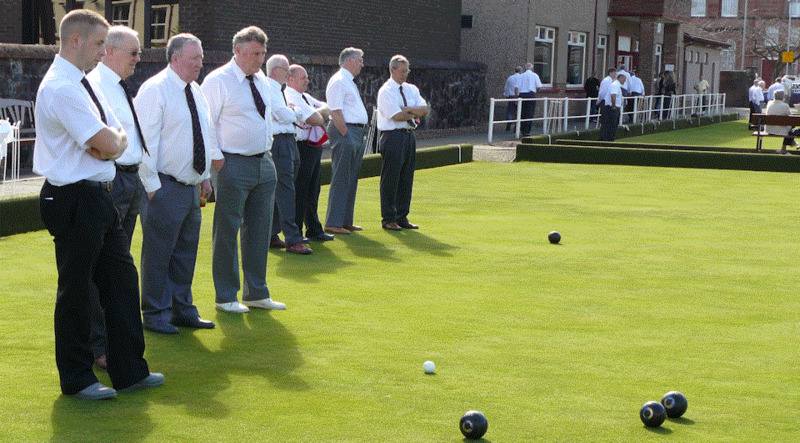 If you are representing the club on another bowling green you should remember that you are an ambassador for the Vale of Leven Bowling Club so please behave appropriately. Enter and leave the bowling green by the steps provided. Do not walk across rinks that other people are using and do not stand or sit on the banks while waiting to play. Note that it is not the banks that are the main problem. We have artificial banks that will withstand some abuse but people sitting on the banks tend to place their feet on the edge of the green causing serious damage. Introduce yourself if necessary and shake hands with your opponent(s) both before play commences and after the game is complete. If you are at the same end as the player delivering a bowl you must stand behind the mat, thus staying out of the player's line of vision. Here is what the Bowls Scotland rule says about this. "Players of each team not in the act of playing or controlling play shall stand behind the Jack and away from the head or 1m behind the mat. " Spectators who are in the player's line of vision should also keep still while bowls are being delivered and they should not distract players on the green. For example if you need to arrange a tie with another member don't try to do this while he is playing someone else! 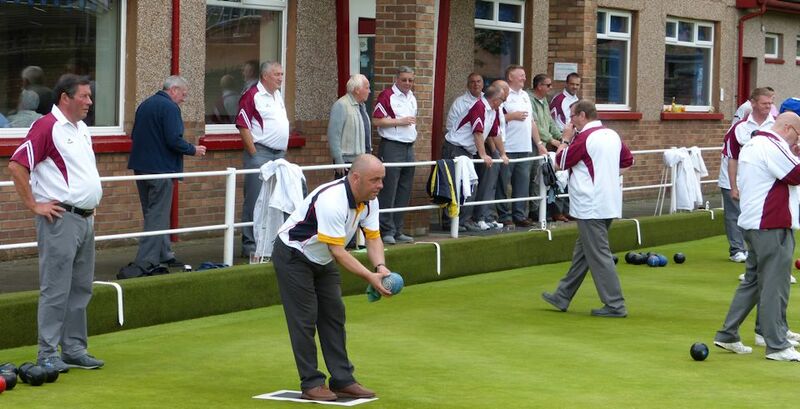 At the Vale we are privileged to have two of the best bowling greens in the area. Look after them! Don't drop your bowls onto the green and ensure that your delivery is not causing scuff marks or otherwise damaging the green. Place litter and cigarette ends in the bins and ashtrays provided for this and do not spit on the green. Here is the SBA ruling on this ..
"Possession of the rink shall belong to the team whose bowl is being played. The players in Possession of the rink for the time being shall not be interfered with, annoyed, or have their attention distracted in any way by their opponents. As soon as each bowl shall have come to rest, possession of the rink shall be transferred to the other team, time being allowed for marking a 'toucher'. " After you have delivered a bowl and before it has come to rest you have two options. If you want to track your bowl's progress you must be behind the head as it stops. In other words you must beat it to the head. If you don't go to the head you must be behind the mat as your bowl stops. This ruling is quite clear but unfortunately many players, including many of those who should know better, show disrespect for their opponents by failing to observe it. How many times have you been on the mat, ready to play your bowl, when you have had to wait for your opponent to complete his stroll up the green or back to the mat? If your opponent is guilty of this you should ask him to stop. Remember that it's them that are in the wrong. The SBA website is a bit more succinct than I have been. Here's what it says about etiquette. 1. Players should use the steps provided when going on or off the Bowling Green. 11. All Bowlers should know the Rules as laid down by the World Bowls Board. After the Game you should once again shake hands with your opponent(s) and congratulate/commiserate with them appropriately. It is also customary to offer to buy them a drink if you have won the game. Where a marker has been involved in a singles game you should also offer him a drink. Knowledge of the above will earn you respect as a bowler. So keep things friendly and contribute towards the enjoyment of the game for everyone involved, both on and off the green. In all team games it is the skip's job to direct the play. Other players should play the shot directed by the skip even if they don't agree with it. In fours games the 'third' should direct the skip when required to do so. In Triples or Pairs the Second or Lead may do this. Other players should not interfere unless invited to do so. Here is what rule 51 in the Bowls Scotland rule book says about players' roles. The Skip shall have sole charge of his team, and his instructions shall be observed by his players. With the opposing Skip he shall decide all disputed points, and when both agree, their decision shall be final. A Skip may at any time delegate his powers or any of his duties to other members of his team provided that such delegation is notified to the opposing Skip. The third player may have deputed to him the duty of measuring any and all disputed shots. The Second player shall keep a record of all shots scored for and against his team and shall at all times retain possession of the score card whilst play is in progress. He shall see that the names of all the players are entered on the score card; shall compare his record of the game with that of the opposing Second player as each end is declared, and at the close of the game shall hand his score card to his Skip. The Lead shall place the mat and shall deliver the Jack ensuring that the Jack is properly centred before playing his first bowl. In addition to the duties specified in the preceding clauses any player may undertake such duties as may be assigned to him by the skip in clause 51(a) hereof. And do it with a smile." During the season, when we are heavily involved in singles ties, markers are required every evening. Consider making yourself available as a marker whenever you can. We all know that there is nothing worse than playing an important tie without a marker. Traditionally, the Vale has been one of the clubs where markers were always available but recently ties without markers seem to be becoming more common. It is not good etiquette to watch games from the sidelines or from the clubhouse while there are people playing without markers. If you have the time get out there and mark a tie! A marker is serving two people. If we all marked one tie for every two we played there would not be a problem. We are fortunate at the Vale to have a few people who happen to like marking ties and they are seen on the bowling green every other night. We all know who they are and they are to be commended. Perhaps there should be special prize awarded for this? He should answer any specific question (from the player in possession of the rink) about the state of the head. He or she should not offer any additional information that has not been requested. When asked, he or she should tell or show the player in possession of the rink which bowl or bowls the marker considers to be shot. If you are unsure of the situation, for example you cannot decide who is lying, don't guess. You can offer an opinion but make sure that the player who is asking the question is made aware of this. The marker should mark all touchers immediately they come to rest and remove chalk marks from non touchers. He should also remove all dead bowls from the rink with the players' agreement. He should also mark the position of touchers and or the Jack which are in the ditch. He/she shall measure disputed shots when required but once again no bowls should be moved by the marker until the players agree the shots for the end. If an umpire is available then he/she may be called upon for a decision. Where no umpire is available the marker may select one. Both players may also agree that the marker should make the decision. This is acceptable at local level. If anyone has any comments or anything to add to this list please feel free to get in touch.